Background: Mucinous cystic neoplasms of the pancreas are distinct entities with malignant potential, the vast majority occurring in middle aged women. The presence of ovarian struma and lack of communication with the main pancreatic duct is required for the diagnosis of mucinous cystic neoplasm. Case history: We report on a twenty six year old female, with a past medical history significant for HIV infection, well controlled with HAART, who presented with post prandial abdominal pain and underwent routine evaluation, including a CT scan. The CT scan demonstrated gallstones, as well as a cystic lesion in the tail of the pancreas. The patient underwent a robotic distal pancreatectomy and cholecystectomy. The patient had a successful resection with negative margins and was discharged home on post operative day nine. 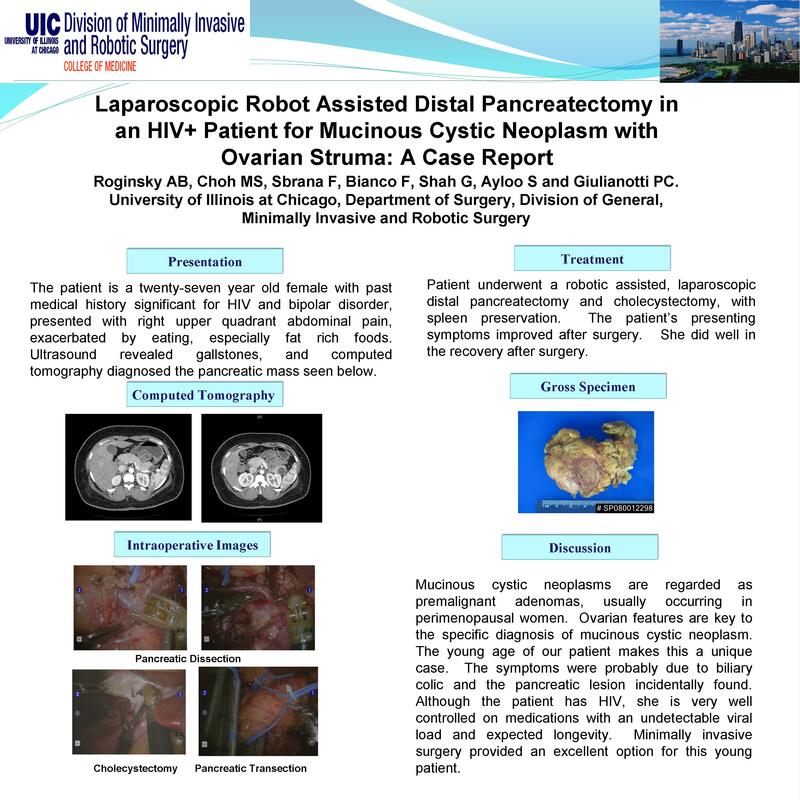 Conclusion: To our knowledge, this is the first report of an HIV + patient with a mucinous cystic neoplasm and robotic resection. As patients with HIV disease live longer and more patients obtain abdominal imaging, this patient population will likely increase, but there is no known association at this time.